To Your Health: 34) WHAT IS BB CREAM? 50 years ago, a German doctor by the name of Dr Christine Schrammek created BB cream. Initially it was created to be used to help heal skin after skin peels as well as hide any scars and redness post peel treatment. Later, it was introduces in Asia, specifically to South Korre K-pop stars and K-drama stars noticed its ability to transform skin. When several big name stars started endorsing it in South Korea, the popularity took off and consumers went crazy for it. 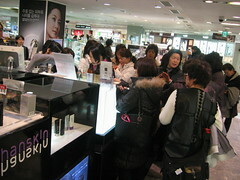 BB cream became so well known in South Korea, that you can find this cream everywhere, from malls to outdoor markets. It is the hottest product now. Surprisingly, the United States is just starting to find out about this marvelous cream. Blemish Balm is a multi-tasking skin product that truly can be the one product your skin needs. It acts as a moisturizer, sunscreen, soothing to the skin, primer and gives full coverage, depending on the brand. Before applying BB cream, our skin still needs real moisturizer applied under. By doing so, the BB cream will be easier to put on and look more natural. It's just a foundation, isn't it? The answer is, yes and no. It is considered as a tinted moisturizer, but with more coverage and many times an amazing SPF level. Every brand of BB cream in the market is different in its ability to cover blemishes and skin imperfections. The variety lies in the coverage, color, matte vs dewy and SPF levels. You just need to experiment until you find the one best suited for you. BB cream is suitable for those of you who do not like a heavy foundation but still want coverage. Two more features of this cream is that it can be used as a concealer or highlighter, too! Is BB cream suitable for you? Actually BB cream is suitable for women and men. It is also very suitable for most people with medium to light skin tone. However, BB cream might have to be mixed with foundation if you have dark skin tone. Typically, BB cream unlike foundations is only just one shade. That is why it is considered a unisex product. However, in South Korea, they have come up with BB creams just for men. If you have darker skin, mix a bit of your own foundation to make it match your skin better. I, myself have been using BB cream for many years and find it indispensable because it goes on so smoothly and even though I have sensitive skin, it does not clog my pores or feel oily at the end of the day while foundation does. I just love my BB cream! Well, I buy my BB cream from a direct selling company as well as from the beauty salon. Look for brands that are from Korea will be the safest bet as they were the very first ones to use this fantastic cream and is decades ahead in terms of production and quality of the cream. Try it and let me know whether you like it....or not. Or click the Related Articles link below to find out one blogger's method of making homemade BB cream. My next topic for discussion is, "Tips on how to use BB Cream". This was one of my earlier works using mix media-ink and pencil.